From meringues to souffles, omelets and facial masks, egg whites jam a lot of nutrition in such a small package and may be the perfect food for skin care. They’re quite popular in the ketogenic diet as part of a combination with a healthy fat, such as avocado, and they can make a great facial mask for a healthy collagen boost. That’s not all when it comes to egg white nutrition. But do you know what egg whites actually are? Yes, they’re the clear liquid of the inside of the egg. That liquid is also called albumen or the glair/glaire. The most common egg we experience is the chicken egg, and the egg white is formed around both fertilized and unfertilized egg yolks and has an important job of protecting the yolk. Of equal importance is the job of providing proper nutrition for the growth of the embryo once fertilized. Much like the human body, egg yolks contain mostly water with about 10 percent being proteins, specifically albumins, mucoproteins and globulins. While the egg yolk is high in healthy fats, the egg white is practically free of fat, and much like the health benefits of eggs, egg white nutrition can do a lot for your health. It’s not uncommon for someone to order an egg white omelet. Historically, egg yolks have gotten a bad rap for causing problems with cholesterol. Because of this concern, the American Heart Association suggests keeping your egg cholesterol consumption to no more than 300 milligrams per day. To put that in perspective, a large egg contains about 213 milligrams. What happens if you just eat the egg white? So we have identified that egg whites are awesome, but what makes them so good? 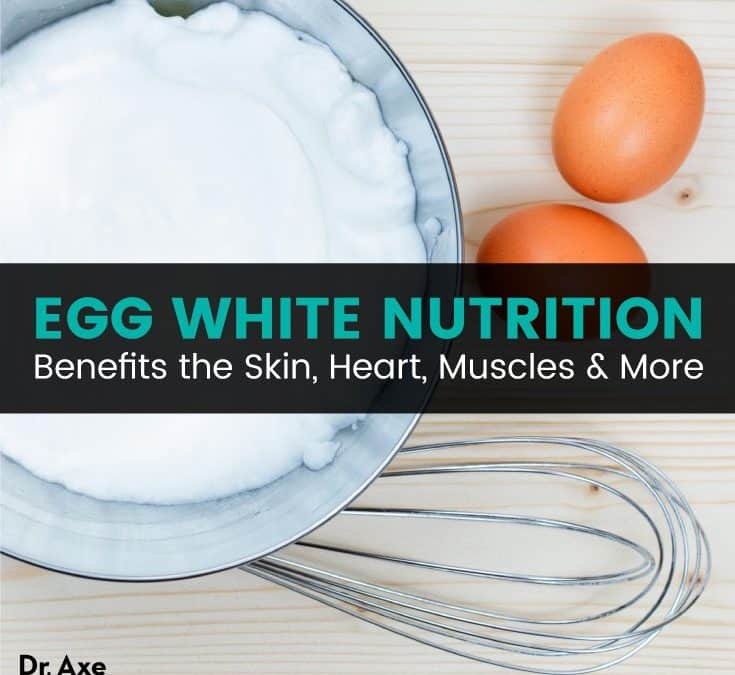 Not only can they taste delicious if properly prepared, but egg white nutrition is loaded with goodness. Let’s dive in and learn why. If cholesterol is something your doctor has asked you to keep in check, then the egg white is for you. It contains no cholesterol but is still loaded with benefits. To put that in perspective, a whole eggs contains the full amount of cholesterol that’s recommended for one day. So, as delicious as it may sound, having that three-egg omelet may not be the best choice. If you’re battling health conditions like diabetes, heart disease or high blood pressure, it’s recommended that you keep your daily cholesterol consumption at 200 milligrams or less — one egg yolk contains 213. One egg white provides close to four grams of protein. Like the nutrition of the egg itself and how it nourishes a baby chick, human embryos also need the best nutrition in order to thrive during development and well after. While eating more protein does not magically create stronger muscles, the right protein at the right time does. Here’s how it works. The body requires essential amino acids to create a complete protein that can only be obtained through meats and dairy products, or a combination of plants sources, such as beans and rice. Glycine is one example, and one egg white contains 1,721 milligrams. When you consume the right protein at the right time, you gain strength because the muscles get what they need to repair and rebuild. For example, if you’re athletic and performed a hard workout, that workout puts stress on your muscles. By consuming a complete protein within 30 minutes of that workout, you can help repair the muscle tissue far faster, resulting in stronger muscles that are ready for the next workout. Sugar has been a hot topic for awhile now. If watching your sugar intake is a part of your regimen, then adding egg whites to your diet may be a great choice. Too much sugar causes numerous problems from heart disease, liver disease, obesity, leaky gut syndrome, slow metabolism — the list is long. Egg whites may be the perfect choice to keep sugar overload in check since they contain no sugar. Potassium is similar to sodium in terms of helping ensure you have sufficient electrolytes in the body. This encourages normal muscle function, helps prevent strokes and keeps a healthy heart. Additionally, electrolytes protect the cells in the body by balancing the fluids that are around and within them, which helps your blood pressure stay in check, particularly in the case of too much sodium. Eggs contain collagen in the membrane just outside of the egg white and just inside of the shell, which serves to protect the egg. If you separate the egg whites, this membrane comes along for the ride. Combined with the beneficial proteins found in egg white nutrition, that can make for an amazing facial mask. Let’s now understand the differences in egg whites versus egg yolks. Of course, the color is the first obvious difference. Remember that the egg white has a job of protecting the yolk. The albumen is the official name for the egg white and is opalescent-like or cloudy. That cloudy appearance comes from carbon dioxide, and as the egg gets older, carbon dioxide escapes leaving the egg with more transparency. So the cloudier, the fresher. Where does the white come in? Well, that happens when the egg white is beaten or cooked. When you crack an egg into a frying pan, the egg white immediately turns from opalescent to white. To further detail the egg white, the albumen has four layers alternating with thick and thin consistencies. The inner thick is called chalaziferous white. Younger eggs maintain the thick layers, but the older eggs start to thin out. You can easily identify the fresher eggs when you crack them into your pan. Fresher eggs stand up a bit more than older ones, which flatten out more. Nutritionally, both egg whites and egg yolks get credit for the protein; however, the whites contain more the the yolks. One large egg white boasts 3.6 grams of protein while the egg yolks contains about 2.7 grams of protein as reported by the U.S. Department of Agriculture’s National Nutrient Database. Overall, the egg lays claim to an amazing amino acid profile, including histidine, isoleucine, leucine, lysine, methionine, phenylalanine, threonine, tryptophan and valine, plus nine more. In fact, it’s so amazing, that the egg is often the guideline for the perfect protein structure, but if cholesterol is a concerns, going for egg whites may help and still allow you plenty of protein. Finally, according to the Protein Digestibility Corrected Amino Acid Score, whole egg scores exceed all other protein foods tested with a total score of 1.21 in the amino acid score rating system — more than the human body needs. Eggs whites may be different than egg yolks in terms of nutrition, but they’re also way different in terms of their structure. You can’t make a fluffy meringue out of the yolk. It has too much fat, and fat breaks the protein bonds. Egg whites are often referred to in a chef’s kitchen as foam. This is due to the fact that egg whites have the ability to become the largest food foam when whipped — about eight times greater than in it’s original state. To get a bit more technical, beating raw egg whites incorporates air bubbles into the water-protein egg white. When you do this or heat it up, it releases the egg proteins or amino acids. Because some amino acids like water and some do not, it creates a frothy or meringue-like juxtaposition, which is how it “stands up.” It’s like a blend of air bubbles and water that support each other by bonding and then expanding. If done right, it then solidifies when heated, which is how grandma made a gorgeous meringue pie or souffle that didn’t fall. You need 3 bowls and a pair of clean hands. Start by cracking an egg, then gently catch the yolk in your hand, allowing the egg white to slip through your fingers into your first small bowl. Then, place the egg white into another bowl (the final egg white bowl where all egg whites will go) and repeat this step for each egg. Ultimately, you want avoid contaminating them with a broken yolk. Once you have separated one, place the yolk into another bowl. You can keep them in fridge in an airtight container for about three days and even freeze egg whites for a couple of months. For the most part, egg whites are safe, but there are few side effects you should know. Biotin, or B7, can be depleted due to too much of a good thing. Biotin deficiencies may cause skin disorders known as cradle cap in infants and seborrheic dermatitis in adults. If there’s excessive loss, you could experience hair loss, seizures, loss of muscle coordination and muscle tone, and muscle cramps. See a doctor if you suspect you have these symptoms. In some cases, eggs can cause allergies. When this happens, the body mistakes egg protein as a harmful substance. You may experience swelling, wheezing, runny nose, watery or red eyes, nausea, diarrhea, or vomiting. Make sure to see a doctor right away if these symptoms occur. Egg white nutrition actually provides more protein than the yolks, and egg whites are used in all types of recipes. They’re cholesterol-free and low-calorie, which is how egg white nutrition benefits the heart, pregnancy, muscles, electrolyte levels and skin. Egg whites also promote satiety and act as a sugar substitute, helping prevent weight gain and fighting obesity.